A large analysis of 73 observational cohort studies and almost 900,000 study participants suggests low vitamin D levels could do far more than cause brittle bones and increase your risk of osteoporosis; it could play a vital role in how long you live. The research, published recently in BMJ, indicates that those people with the lowest levels of 25-hydroxyvitamin D blood concentration had a 35 percent higher risk of death by cardiovascular disease, lymphoma, upper digestive cancer, and respiratory disorders than those with the highest levels of D.
Those with the least vitamin D also had a 30 percent higher risk of death from non-cancer, non-vascular causes, and a 14 percent higher risk of death from cancer. The researchers estimate close to 70 percent of Americans are deficient in vitamin D, defined as having less than 30 ng/mL of vitamin D/blood. In Europe, deficiency is even more widespread, with the study authors putting that rate at about 86.4 percent. Read: Can Vitamin D Dispel Depression? The risks associated with this deficiency, the authors suggest, can be mitigated with D3 supplementation. 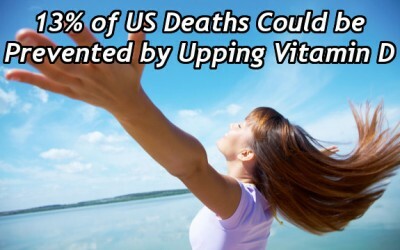 Supplementing with vitamin D3 reduced the risk of premature death by 11 percent. Vitamin D2 supplementation, on the other hand, had no effect on overall morality. In fact, there are numerous reasons to go with the natural vitamin D3 rather than the fake vitamin D2. I take the centuries old remedy of Cod Liver oil everyday which contains the natural source of vitamin D & A plus E and Omega 3.